Sherri was born and raised in Effingham. She graduated from St. Anthony High School in 1985 and Lakeland Community College in Mattoon in 1987 where she obtained an Associate’s Degree in Business Management. She went on to receive certificates from Penn Foster Career School as a Legal Assistant and Medical Office Assistant. Her first job was as a dance and gymnastic instructor. She later worked for her father, Lloyd Ziegler, at their family-owned Sears store. 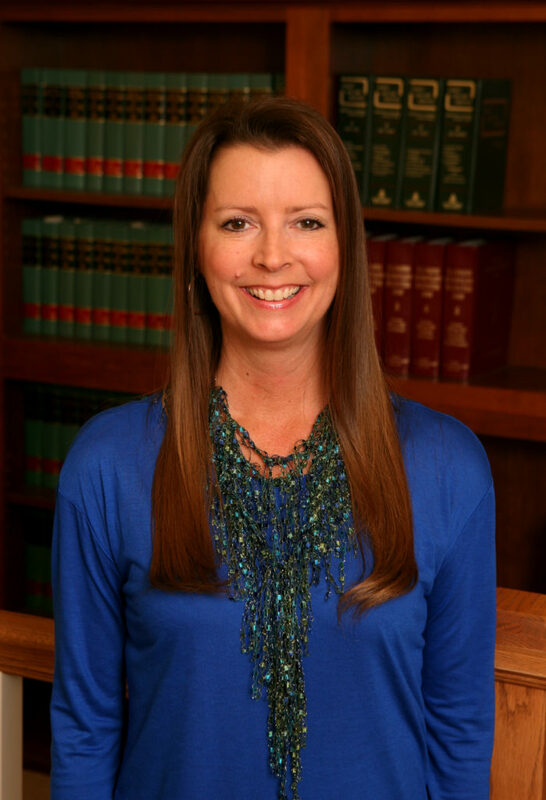 Sherri began her career as a paralegal in 1987 at the Law Office of Fred Hicks. She accompanied Mr. Hicks to court, sat at counsel table, assisted during hearings and took notes of the proceedings. She worked for Mr. Hicks until the birth of her first child in 1993. Thereafter, she worked from her home and later in the office for Professional Software, Inc., her husband’s employer at the time. Sherri returned to the legal field in September of 1998 at Schniederjon, Weber & Jarrett. She and her husband, Jeff, went into the office to sign their Wills, she had an interview immediately following and was hired all in the same day. The firm changed its name to Schniederjon, Weber & Orr when Jim Jarrett retired from the practice of law in order to become a teacher and baseball coach. Currently Sherri primarily assists Twila with family law cases. She has volunteered at the Future Fairs to answer questions from junior high and high school students regarding her career as a Paralegal. She married Jeff Wohltman of Dieterich a week after graduating from college in June of 1987. Jeff is currently a software engineer at RedCard in St. Louis, Missouri. They have two sons. Jeremy, age 24, graduated from Lincoln Land Community College in Springfield, Illinois with an Associate’s Degree in Computer Science and then earned his bachelor’s degree in Computer Science from Indiana Technical Institute in Fort Wayne, Indiana. He attended both colleges on basketball scholarships. Jeremy is now a junior software developer for Hewlett-Packard in Houston, Texas. Jason, age 21, graduated from Effingham High School, attended Lakeland College and recently transferred to Southern Illinois University-Edwardsville where he will earn a bachelor’s degree in Historical Studies with a minor in Web Technology. While at Effingham High School, he was a 4-year member of the tennis team and earned a berth to play in the state tennis tournament in Chicago during his junior and senior years. He finished in the top 50 teams in the state in 2014. The Wohltman family is an active one. Jeff and Jason enjoy playing tennis during the summer while Sherri and Jeremy enjoying running, walking, biking and weight lifting. Sherri competed in her first 5K race in April of 2013 on the University of Illinois campus, along with Jeremy. She also competed in her first half marathon at Walt Disney World in February of 2015, then returned to Walt Disney World to run a 10K in February of 2016 and has completed 5Ks in St. Louis, MO, Houston, TX and San Juan, Puerto Rico. Her goal is to complete a races in as many states as possible.